Dr Cecilia Bergh and Professor Per Södersten received the award from the Swedish Minister of Trade Ann Linde at World Trade Day in Stockholm. The Export Pioneer award was instituted by The Foundation for Export Development and Stockholm Chamber of Commerce. You will find us at H01:05. Welcome! They listened to the theory and clinic of the treatment and appreciated not least the clinical part. Everybody is interested in under- and overweight, there were many questions. 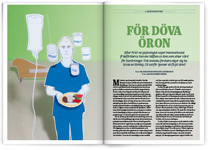 “Fall on deaf ears” is an article about Mandometer and eating disorder treatment in Sweden. It is actually 1106! And as only 10% of the patients relapse over five years of follow-up, 1000 patients have recovered. 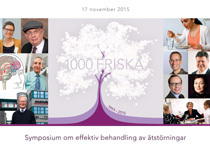 Mandometer celebrated the occasion with a symposium in central Stockholm. 130 participants, including basic scientists, granting agencies and health care politicians listened to three young women who have recovered and are now pursuing their education and business careers. They also heard Mandometer´s medical director in San Diego review his success in treating US-patients and the father of the first Australian patient via a video recording. International summer students from KTH visited Flemingsberg Science to hear about Mando Group´s journey from research - innovation - product. Billy Langlet presented the EU-project SPLENDID. The EU-project SPLENDID met in Wageningen, Holland, 18-19 May with its scientific advisors: Julian Shield, University of Bristol, Anton Scheurink, University of Groningen and Jaakko Tuomilehto, University of Helsinki. 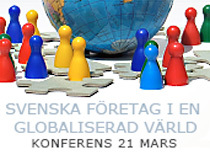 Cecilia Bergh Cecilia Bergh is invited to speak at a seminar focused on the export of Swedish health care organized by Veckans Affärer and Dagens Medicin. Anna Starbrink and Daniel Forslund from the Stockholm City Council visited the Mandometer Clinic in Huddinge to learn more about our treatment and of course try the Mandometer scale. We have had no less than four visits from politicians over this last month. We will exhibit Mandometer5 at the American Diabetes Association EXPO New York. March 14 10:00 a.m. to 4:00 p.m.
TEM, our partner manufacturer of Mandometer generation 5, visited us for a productive workshop. 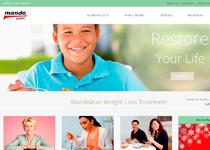 We have released a new website for our New York Clinic focusing on weight loss treatment. Soon, all our sites will benefit from an updated design. "A place where one is noticed and appreciated by management and colleagues. A place where one goes the extra mile. The team spirit and enthusiasm on display yesterday makes it clear for me why this company is showing such strong results." Happy Holidays from us at Mando! 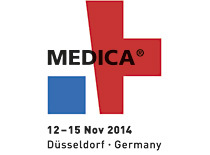 Mandometer at MEDICA - World Forum for Medicine. You will find us at Business Sweden, Hall 01/D18. Welcome! Mando is proud to be a part of the EU-project SPLENDID together with expert scientists and engineers from five European countries. We are developing a personalised guidance system that can monitor and guide young individuals to improve their eating and activity behaviour. The Mandometer device was featured in CBS New York. 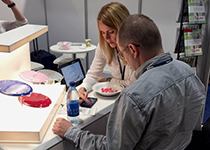 "‘Eating Smart’ With High-Tech Utensils"
Great success when Cecilia Bergh presented Mandometer generation 5 at Digital Health Days 2014 in Stockholm. Many young women diet to avoid getting overweight, some lose control and develop anorexia. But hundreds of women have recovered by learning to eat normally, thereby resolving all of their problems. The new paper explains how eating behavior acts on the brain to restore the health of underweight women. NYC staff participated in Mando Academy sessions chaired by Cecilia Bergh. 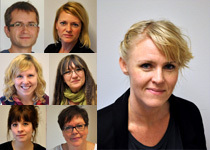 AB Mando is awarded a contract with the Västra Götaland’s region in Sweden to treat patients with eating disorders. "Could these 'smart scales' cure anorexia? 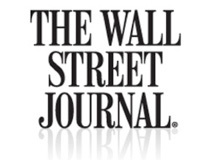 75% of patients who used device were free of symptoms a year later." 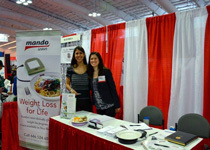 New York Clinic presented Mandolean at Diabetes EXPO in NYC. Our research results continue to attract media attention in Australia. 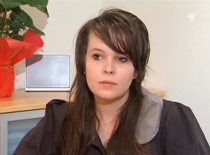 For years Hayley struggled with an eating disorder. interviewed by ABC News Australia. 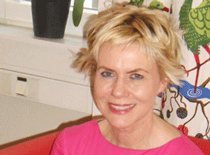 Cecilia Bergh is interviewed by "Bosnisk Post"
Mandometer Clinic has Breakthrough in Treating Anorexia and Bulimia. 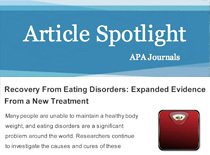 The Mandometer Clinic announces the publication in the American Psychological Associations’ journal Behavioral Neuroscience, its groundbreaking study on Effective Treatment of Eating Disorders: Results at Multiple Sites. 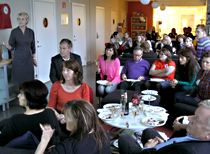 On 26 November, Jan Ståhlemark, CEO of Mandometer AB, got all excited! Mandometer was awarded a 1 million SEK research grant from VINNOVA, Sweden´s Innovation Agency, to make Mandometer available to obese patients in primary care. The clinical Staff at Mando Group has already shown that it works. 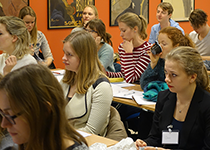 Mando Group AB´s regular and appreciated course: Mando Academy started on Monday, 11 November. 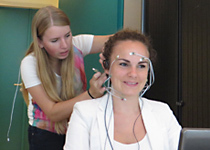 The neural engagement in eating and body weight regulation is followed by Mandometer theory and treatment, including clinical demonstrations and practical applications. The lectures are interactive; the teachers enjoy being interrupted by almost any question. And the students enjoy being certified after the course! 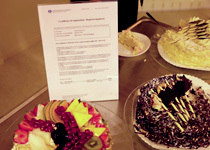 Mando Group Staff celebrated that the Medical Product Agency of Sweden has registered Mandometer as a medical device. 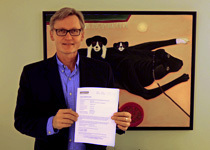 Mandometer has already been cleared by the US Food and Drug Administration (FDA) for the treatment of eating disorders. Clearing a new medical device is the time consuming first step in making it possible for all in need to use the device. Ioannis Ioakimidis met his new research colleagues from Greece, Spain, Switzerland and The Netherlands to start SPLENDID, the big research grant that he won in competition with more than 250 European researchers. The project started with two days of planning in Thessaloniki and aims at preventing body weight problems by developing mobile technologies for personalized behavioral health. Mando Group AB välkomnas som medlem i Karolinska Institutet Science Park. 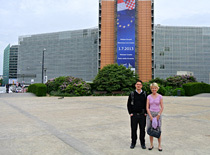 EU-grant for prevention of over- and underweight. In fierce competition, Ioannis Ioakimidis, of Mando Group AB, has been awarded an EU-grant together with researchers in Greece and Holland and electronic engineers in Switzerland and Spain to develop methods for continuously monitoring eating behaviour and physical activity in children and adults. 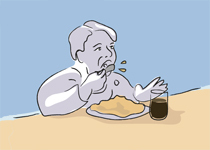 The grant aims at preventing people from becoming over- or underweight. Jennie Sjöberg from the Mandometer Clinic in Alingsås speaks about eating disorders. School children at risk of losing control over body weight. Mandometer researchers examined how 11-13 year old children eat their school lunch. Although the lunch break is 45 minutes long, the children have so little time to eat their lunch that they eat almost twice as quickly as they would normally do. The shortage of time makes children eat in a manner similar to that of obese patients and patients with eating disorders. The school lunch must be scheduled to allow the children time enough to eat their lunch in a relaxed manner, or they might lose control and develop health problems. 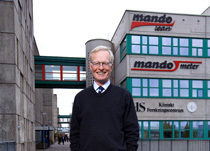 Hans Dahlgren visited Mando Group AB on October 24. Mandometer methods for control of body weight and their scientific basis were reviewed and the Minister met with healthy people who had been treated with Mandometer. 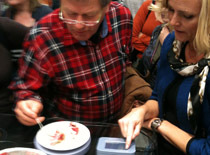 The Minister herself also got the chance to eat using Mandometer! 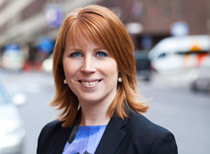 Annie Lööf will visit Mando Group in Sweden. October 24, 2012, 10.30 a.m.
10 year anniversary at Mando! In October 10 years ago, an in-patient ward was launched at Mando, all patients can now be treated, including the most severely ill. Mandometer treatment starts already at the in-patient ward with criteria for how patients shall improve before they continue as out-patients. The treatment has improved, the patients do not need to be tube fed and ineffective drugs are gradually removed. Filippa Reinfeldt, Catarina Andersson-Forsman, Torbjörn Rosdahl and Hans-Erik Malmros of Stockholms City Council visited Mando Group NY. They were provided with an overview of the Mandometer Treatment and of a review of the possibilities for export of Swedish medical services to the US. 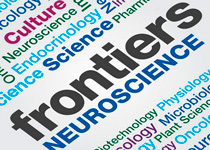 Show program; "A Safe Alternative to Surgery for Obese Adults and Children"
Mandometer researcher participated at 2nd International Conference on Food Oral Processing - Physics, Physiology, and Psychology of Eating. 1-5 July 2012. Beaune, France. There was a considerable amount of interest in Mandometer methodology and many contact were taken with researcher at the nearby Institute du Gout in Dijon, the biggest laboratory for food research in Europe. Radio Sweden broadcasted an interview with Josefine who says she would not have been alive today without the help of the Mandometer Clinic. Cecilia Bergh was invited to talk at the Employers Group of the European Economic and Social Committee thematic meeting on cooperation in the Baltic Sea region entitled "The Baltic Sea Region and Business, a Model for European Macro Regions?" on 14th-15th June 2012. 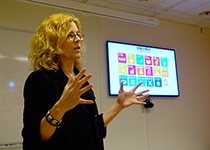 Cecilia Bergh was one of six speakers when Vinnova together with Samhällsförlaget launched the book "Forskning - till vilken nytta" ("Research - to what use"). Her talk was entitled "Vad ska vi med forskning till?" ("What do we need research for?"). The swedish magazine "Veckans Affärer" lists Mando Group as one of "Sweden's 50 new superstars". While it is easy to lose some weight, it is virtually impossible to keep it off. Australian researchers (1) have figured out why. 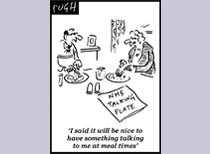 Obese patients dieted for eight weeks and, as expected, they lost some weight. At the same time, however, ghrelin, a hunger hormone, increased and PYY, a satiety hormone, increased in their blood. These hormonal changes persisted over more than a year and this is why people who are on a diet feel hungry all the time. 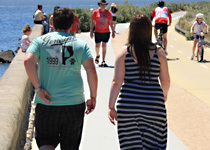 To prevent obesity, these hormonal changes should be targeted, suggested the Australians. 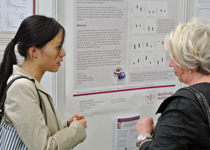 Mandometer researchers (2) solved the problem because the hormonal changes that put you at risk are prevented if patients learn to eat using Mandometer. 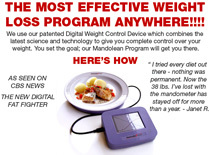 Using Mandometer is easy and has no unwanted side effects. Quite the opposite, you regain control over your hormones and lose weight without feeling hungry! 1. Sumithran P, Prendergast LA, Delbridge E, Purcell K, Shulkes A, Kriketos A, Proietto J. Long-term persistence of hormonal adaptations to weight loss. N Engl J Med 2011;365:1597-604. 2. Galhardo J, Hunt LP, Lightman SL, Sabin MA, Bergh C, Södersten P, Shield JP. Normalizing eating behavior reduces body weight and improves gastrointestinal hormonal secretion in obese adolescents. J Clin Endocrinol Metab 2012;97:E193-201. Per Södersten, director of R&D at Mando Group, was one of the opponents at a PhD thesis defense at Wageningen University in Holland on May 2. The thesis explores how the characteristics of food affect the way you eat and the findings may contribute to a solving the obesity problem. 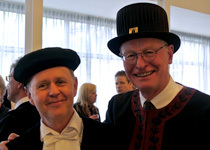 The defense of a doctoral thesis is more of a festivity in Holland than it is in Sweden. 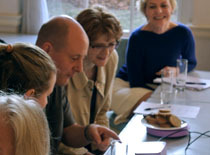 Visiting Bristol on 26-30 March, Mando Staff taught nurses how to use Mandometer to manage obese children and their family in the comprehensive study which starts shortly. A large group of enthusiastic researchers, including a dietician, an economist, medical doctors, psychologists, and a statistician, is engaged. The study aims at implementing Mandometer in primary care. 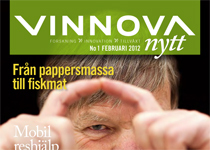 Dr. Cecilia – an example of translational research – is described in the latest issue of Swedish VinnovaNytt. "Stop! You are eating too fast!" Swedish newspaper Aftonbladet writes about both our method and Mary Stahl-Brolén who is a patient at the Mandolean Clinic. 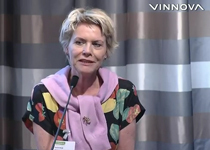 Cecilia Bergh is interviewed by Swedish Entrepreneurship Forum. 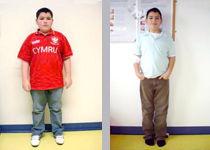 Our work with obese children and their families is generating media attention. H.R.H. Prince Daniel's visit to our New York clinic is featured in Svt's program entitled "The year with the Royal Family". A news editorial about our obesity treatment was aired on Swedish Tv4 News. Wednesday December 7 at 5.30 p.m.
Cecilia Bergh is invited to talk at the Medeon Life Science seminar in Malmö. 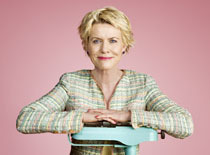 Her talk is entitled "You are not what you eat, but how you eat"
Tuesday November 15 at 4 p.m. Per Södersten guest lectures at Scandinavia’s largest health fair. November 11 at 6 p.m.
H.R.H. 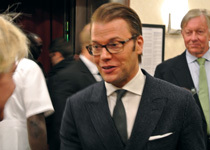 Prince Daniel, visits Mando Group and Lenox Hill in New York. 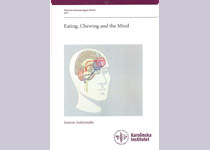 1 November 2011, 2.30 p.m.
Ioannis Ioakeimidis defends his doctoral thesis "Eating, Chewing and the Mind" Section of Applied Neuroendocrinology, Karolinska Institute. Record breaking attendance at this year’s science seminar at the Gothenburg Book Fair, where Mando participated. Tuesday 4 Oktober 4, 12.10 p.m. at Stockholmsmässan in Älvsjö. 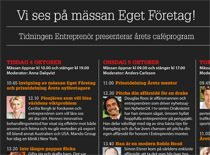 Cecilia Bergh will take part in "Café Entrepreneur" at "Eget Företag", theleading Nordic exhibition for starting and developing new companies. Mandometer® received the Healthcare Technology Acceleration Award in 2011 from the California HealthCare Foundation, Booz Allen Hamilton and the Robert Wood Johnson Foundation. 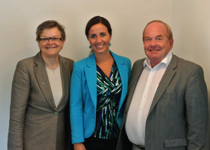 Sweden’s social minister Göran Hägglund and his State Secretary Karin Johansson visited the Mandometer Clinic in Stockholm. They heard the patients’ own stories on getting healthy by learning how to eat and even experienced first hand eating using the Mandometer. Case Managers and researchers also provided information about the organisation and discussed with the Minister plans on how others could become healthy thanks to Mandometer. Mando will take part in the science section of the Göteborg Book Fair. An article about the Mandometer Clinics was published in the newspaper Alingsås Tidning. 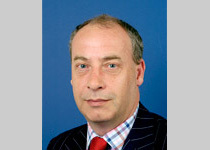 A prize for scientific merit of a project given by the European Society of Paediatric Endocrinology has been given to professor Julian Shields for Mandometer Treatment. 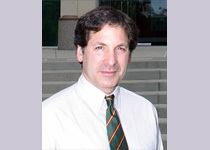 In 2008 he was awarded by BUPA for best clinical trial (Mandometer). Per Södersten was presidential keynote speaker at the Annual Meeting of the Society for Behavioral Neuroendocrinology on June 23-26 in Queretaro, Mexico. His talk was entitled: "Translating behavioral neuroendocrinology into clinical practise and explained the scientific basis for Mandometer treatment of underweight and overweight patients." 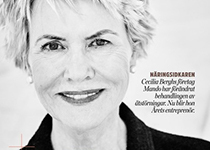 Cecilia Bergh is interviewed in the online magazine E24. 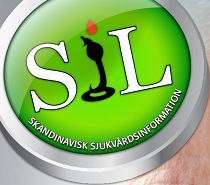 An article with professor Per Södersten is published in SIL - Skandinavisk sjukvårdsinformation. 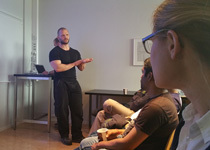 new clinic in New York City with special guests and members of the Stockholm headquarters. NY1 health and fitness reporter Kafi Drexel visits our Manhattan facility. 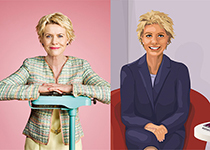 Cecilia Bergh, CEO of Mando Group, was interviewed in the Swedish newspaper "Entreprenör". 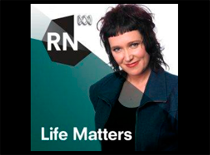 BBC aired an editorial about our treatment. Our treatment is getting attention in Swedish media. New York, N.Y., Jan. 6, 2010 – The British Medical Journal released today a report on a study conducted in Bristol, United Kingdom, that found that a breakthrough Swedish program using a computerized device called "Mandometer®" was significantly more successful than standard treatment at helping obese children and adolescents lose weight, reduce meal size and decrease their body fat. Modjtaba Zandian defends his doctoral thesis "You are how you eat"
Section of Applied Neuroendocrinology, Karolinska Institute. 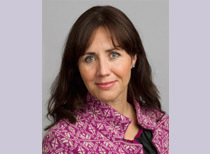 Welcome to a seminar at the Mandometer clinic in Huddinge on the occasion of Australia's Health Minister, Lisa Neville's visit at the Karolinska Institutet when she will discuss the possibilities of extending the treatment of over- and underweight in Australia.